Armagh's Jason Duffy. ©INPHO/Presseye/Lorcan Doherty. Armagh opened their Dr McKenna Cup Section B campaign with a 25-point demolition of St Mary's at Oliver Plunkett Park, Crossmaglen. The result was never in doubt after Jack Grugan raised the game's first green flag inside the opening minute to give Kieran McGeeney's charges a 1-2 to 0-0 lead. The hosts had extended their advantage to eight points before Stephen McConville opened the students' account from a 10th minute free. Ryan Coleman reduced the gap further before Jason Duffy bagged Armagh's second goal to leave it 2-6 to 0-2 after 14 minutes. It continued to be one-way traffic for the rest of the half as Stefan Campbell, Ryan McShane and Jack Grugan added goals to help the Orchard to a massive 24-point lead, 5-12 to 0-3, at the interval. The second half was more competitive as points from McConville and Aaron Duffy narrowed the arrears before Connaire Mackin's 56th minute goal made it 6-16 to 0-6 in the winners' favour. 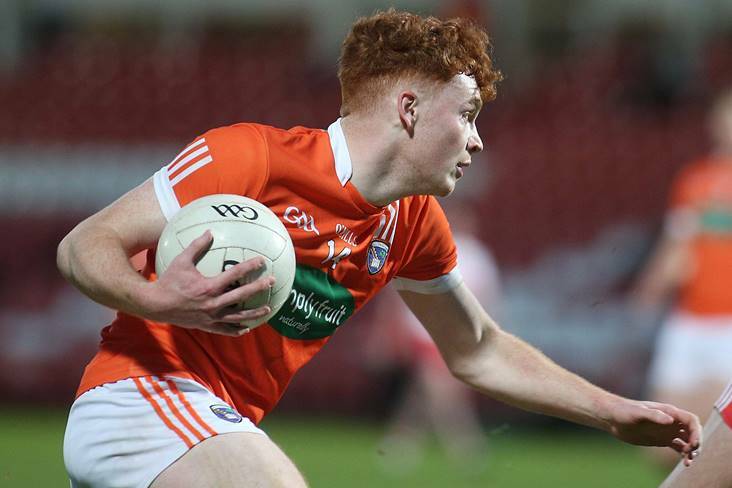 Ryan Coleman scored a late consolation goal for the students who will face Monaghan after Christmas, while Armagh's next game will be against Antrim at Corrigan Park on January 6. Armagh - S O'Hanlon; G McCabe, R Kennedy, R McCaughey; C Mackin (1-1), B Donaghy, R McQuillan (0-1); N Grimley, J Og Burns (0-2); J Hall (0-2), R Grugan (0-2), R McShane (1-1); J Duffy (1-2, 0-1f), J Grugan (2-2), S Campbell (1-0). Subs: R O'Neill (0-1f) for J Hall, J Morgan (0-1) for R McQuillan, P Casey for N Grimley, A Forker (0-2) for B Donaghy, J McElroy for J Grugan. St Mary's - B McKinless; C McAllister, C Dillon, M Rooney; C Byrne (0-1), R McCusker, J Hannigan; S McConville (0-4, 3f), A Duffy (0-1); A Boyle, R Coleman (1-1), T O'Kane; D McKinless, N Toner, R McSherry. Subs: C Goodwin for T O'Kane, P McSorley for A Duffy, T Sludden for D McKinless, G O'Neill for R McSherry.